In this article I would like to discuss our place within the Solar System, and the origin of this magnificent structure as well. The Solar System is a gravitationally bound system comprising the Sun and the objects that orbit it, either directly or indirectly. 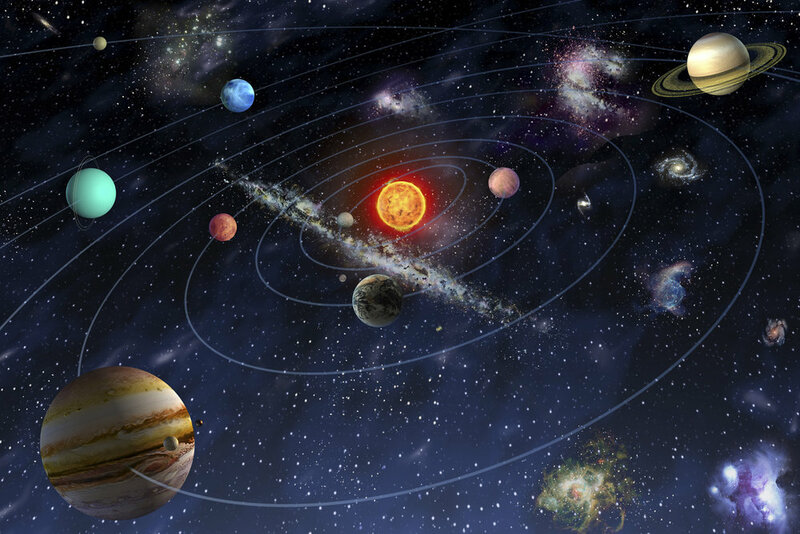 Of those objects that orbit the Sun directly, the largest eight are the planets with the remainder being significantly smaller objects, such as dwarf planets and small Solar System Bodies. Of the objects that orbit the Sun indirectly are the moons, of which two are larger than the smallest planet, Mercury!The Solar System formed 4.6 billions years ago, from the gravitational collapse of a giant interstellar cloud of dust and gas called the Solar Nebula. The vast majority of the system's mass is in the Sun, with most of the remaining mass contained in Jupiter. The four smaller inner planets, Mercury, Venus, Earth and Mars, are terrestrial planets, being primarily composed of rock and metal. The four outer planets are giant planets, being substantially more massive than the terrestrials. The two largest, Jupiter and Saturn, are gas giants, being composed mainly of hydrogen and helium; the two outermost planets, Uranus and Neptune, are ice giants, being composed mostly of substances with relatively high melting points compared with hydrogen and helium, called ices, such as water, ammonia and methane. All planets have almost circular orbits that lie within a nearly flat disc called the ecliptic. As mentioned above, different planets are built from different materials, although they formed from the same cloud of gas. Why such a diversity? The answer lies within the relation between distance from the Sun, the temperature and the planets building blocks ability to condense out from the Solar Nebula. Closer to the Sun, only the materials of the highest melting points, like rocky silicates and iron could condense and form rocky (terrestrial) planets. So, where is the water on Earth came from then? Most likely it was incorporated and locked within other minerals, therefore protected from evaporation. However, when small granules of matter start to collide with each other, they not only "glued" with each other, forming larger and larger objects, they also generated significant amount of heat. When those objects became bigger (so called planetary embryos), the amount of heat generated and accumulated within the objects interior was high enough to melt the material and release the water. This primordial heat, coupled with heat generated by the decay of radioactive elements incorporated within the material forming Earth, drives our geology today! And what about the gas giants? Obviously, hydrogen and nitrogen, the main ingredients of Jupiter and Saturn have much lower melting points than rocky silicates and iron, therefore they have to be formed further away from the heat of the Sun. You might noticed that the most outer planets, Uranus and Neptune are built from even more stable materials compared to helium and hydrogen - water, ammonia and methane. Shouldn't that be other way round? Yes, it should indeed! In fact, this is exactly how it happened, the two biggest planets in our Solar System, Jupiter and Saturn had such a massive gravitational influence on each other and the closest planets Uranus and Neptune, that it caused them to move outwards! Jupiter itself moved slightly inwards, luckily not too close to Earth, so our planet could take a truly perfect spot within Sun habitable zone...but that's a topic for another story!